For all you science buffs who are looking for a way to introduce your kids to your favourite subject here's a book that makes science a little more kid friendly and fun. In 50 Poisonous Questions: a Book with Bite, tweens and teens can discover not only about creepy vipers with fangs, but also how their lethal venom is used to create antivenins to treat snake bites. Using a question and answer format, the book addresses poisonous reptiles, amphibians and bugs, lethal plants, murderous metals, noxious gases, vile villains, man-made chemical spills and natural disasters, and poison that if used in a particular way may be helpful to humans. Using playful language and funny cartoons, the book introduces young readers (and their parents...) to some basic principles of the immune system and terms, such as bioaccumulation, biomagnification and biohazards, without getting into any complicated explanations. This is the perfect book for kids who love reading but find science too abstract or serious, as the book provides the reader with plenty of entertaining historical facts. This is also a great book for parents and kids to read together. In fact, some parents may find themselves sneaking off to read about the original purpose of DDT or how Agent Orange got its name. In Mean Beans, the reader is asked whether a jar of green beans can be poisonous. Well, it is if your beans have been poorly preserved and contain a bacteria that produces botulin toxin, the most powerful neurotoxin known to man. Botulism poisoning causes gradual paralysis in the face and arms until it eventually shuts down the lungs. Botulism is indeed rare, but it is also used as the main ingredient in Botox, which weakens facial muscles and makes wrinkles less noticeable. Mercury's Rising sets up a riddle for the reader to solve. After Hydro Québec constructed a series of hydroelectric dams in central Canada in the 1960s and flooded large wilderness valleys, native groups began dying from mercury poisoning. Hydro Québec proclaimed its innocence: it had never dumped or used any mercury. It was later discovered that the mercury, a naturally occurring mineral in soil, had dissolved into the water, thus contaminating the fish and poisoning the people who ate the fish. The problem was solved once the reservoirs were flushed out. Many adults will remember Susan Nellis who was once suspected though never convicted of being a Vile Villain. In the early 1980s, Nellis was a nurse at Toronto's Hospital for Sick Children when in less than a year, 36 babies died from overdoses of digoxin, a medication derived from the foxglove plant. After a 44-day trial, it was decided that there was insufficient evidence to continue. Years later, some experts suggested that a bad batch of digoxin may have caused the deaths, while others believed that it was a chemical from the intravenous tubing used at the Hospital. Poor Nellis! This is a good example to show kids that there are many factors at play and that finding the guilty party or deadly substance is not as easy as it is made to appear on TV. This is a great read for the budding environmentalist or the teen who loves mysteries.The book also includes a list at the back for further reading and research, and an index for those who want to read up on one specific topic at a time. 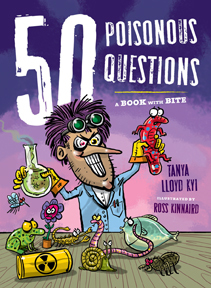 50 Poisonous Questions: A Book with Bite is a great idea to get your kids into the back-to-school spirit. : Review: 50 Poisonous QuestionsTweet this!